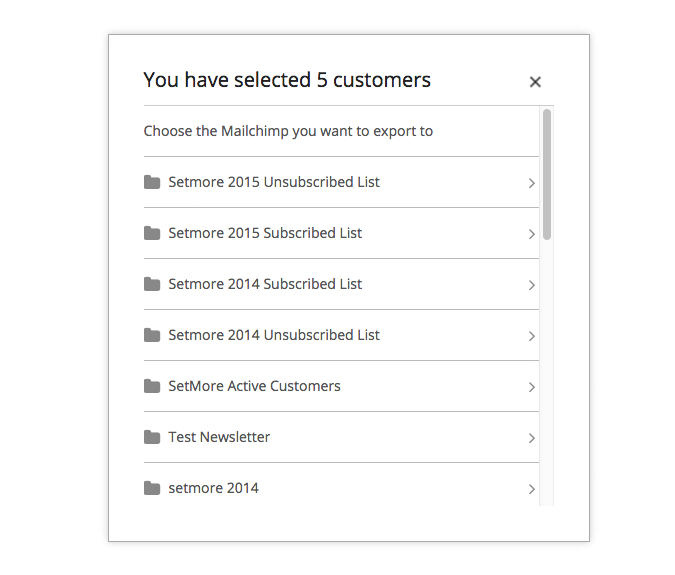 This integration automatically exports your new customer contacts from Setmore into your MailChimp subscriber list. It works if you manually create a new customer through the Setmore admin dashboard, or if customers add themselves to your contact list through your Booking Page. For the best results, you'll want to make sure that the MailChimp contact fields match the contact fields in Setmore. We'll cover this in a later section, below. Please note: Custom contact fields that you add in Setmore will not work with this integration. So any custom info that you're getting from customers won't be exported to MailChimp using this integration. Only data in Setmore's default contact fields (Name, email, phone number and address) can be exported. When activated, this integration will automatically export all new customer contacts to MailChimp. However, if you want to export existing customer contacts, you'll need to follow a separate process which we'll cover in a later section, also below. 1. In Setmore navigate to Apps & Integrations, then scroll down and click on the MailChimp integration card. 2. In the MailChimp details window, click the "Activate" button. 3. You'll be prompted to log in with your MailChimp username and password. 4. 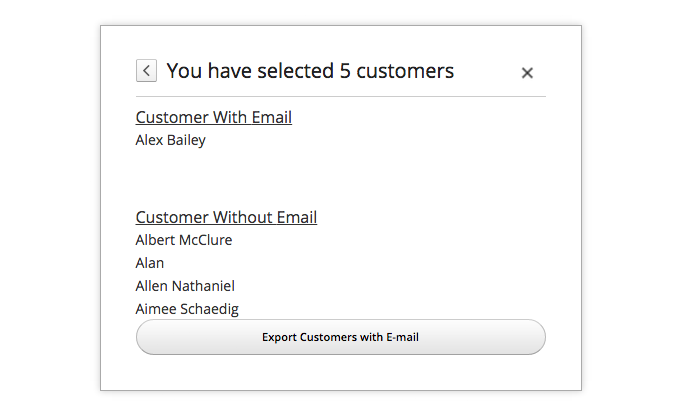 Next, select which subscriber list you would like to export your Setmore contacts to. A message will appear to confirm the integration is successfully activated. 5. For best results, you'll want to match your Setmore contact fields to your MailChimp contact fields, which we'll cover in the next section. 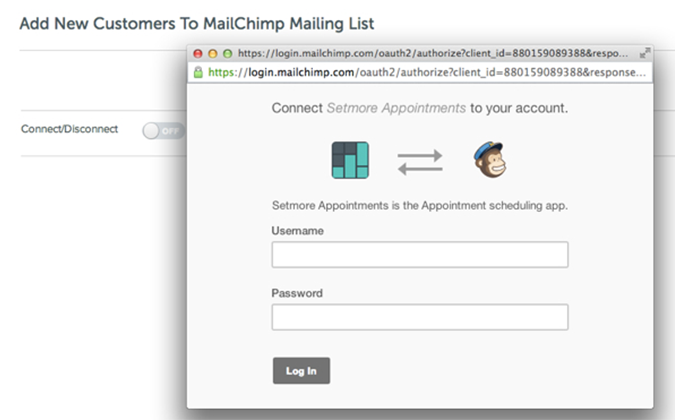 Your data fields for each customer contact should be the same in both Setmore and MailChimp. For example, if you want to export the fields for Name, Email and Phone, then your Setmore customer contact card should have these fields and your MailChimp customer profile should have these fields too. The form field titles should be identical across both platforms, including spaces, dashes, and capitalization. Please note: this integration can only export Setmore's default form fields for name, email, phone and address. Any data in customized form fields will not be exportable. 1. You can verify your Setmore customer details by navigating to Apps & Integrations, and clicking the "Configure" button under Your Booking Page. 2. Next go to the Booking Policies tab, and scroll down until you see the "Contact Fields" section. Verify that these are the contact fields you have and determine which ones you want to export. Note that "Name" field is included by default but is not displayed here. 3. In a separate browser tab, open MailChimp and navigate to Lists, then click Settings. Select "List fields and MERGE tags." 4. Here you can see a list of all contact data fields. Cross-reference these data fields with those in your Setmore account. Also check that the labels under "Put this tag in your content:" match the titles of each contact field. These must match to ensure a proper synchronization! 1. In Setmore, navigate to Customers. Mark the checkbox next to each customer you wish to export to MailChimp, and then click "Export to MailChimp." 2. 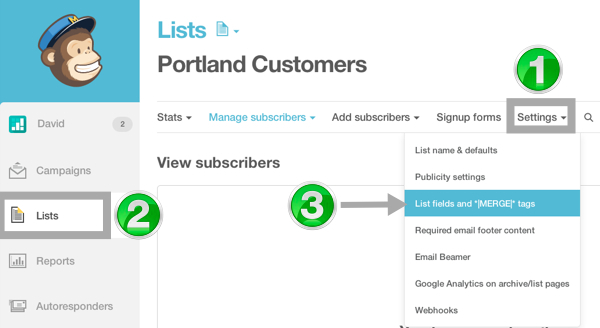 Select which subscriber list in MailChimp you want to export customer contacts into. 3. 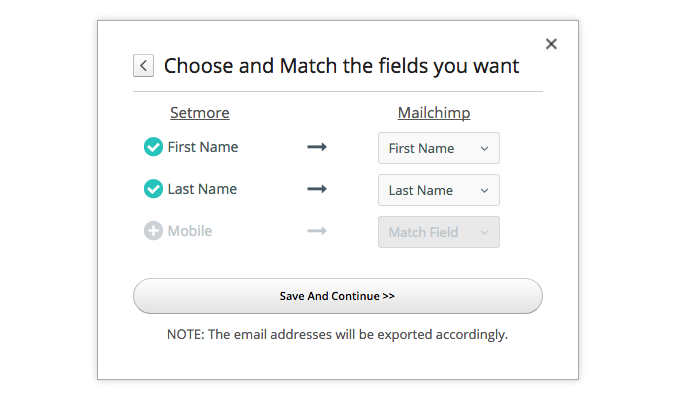 Select and match the preferred data fields from Setmore and their recipient data fields in MailChimp. When everything looks good, click "Save and Continue." 4. Because the integration can only export customers who have an email address in their profile, you'll see an alert that notifies you if any of your chosen contacts don't have an email address listed in their profile. Go back and enter an email address for the customer, otherwise click "Export Customers with Email" to complete the export.